Ganei Beantown project focused on adding a family and youth workshop at their annual Boston Jewish Food Conference. This annual springtime event that fosters new dynamics and connections within the Jewish community by utilizing food and agriculture to discuss the intersections of justice, sustainability, and culture against a background of Jewish traditions and contemporary life. The conference location changes every year, as Ganei Beanton is building a constituent base in the community. 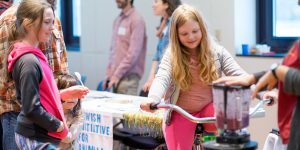 The conference includes multiple workshops (in the kitchen and classroom) and culminates in a Community Celebration & Shuk (marketplace), featuring experiential, do-it-yourself activities, advocacy opportunities, tabling by community organizations, a silent auction, and live music. Participants also help to prepare a kosher, vegetarian dinner alongside chef educators. The community comes together to celebrate over the meal at the Shuk and has the opportunity to express gratitude, engage with presenters and other participants while mingling with vendors, community groups, and representatives from local farms. Support from the Gendler Grapevine Project enables Ganei Beantown to develop and implement a new workshop track focused on youth and families.